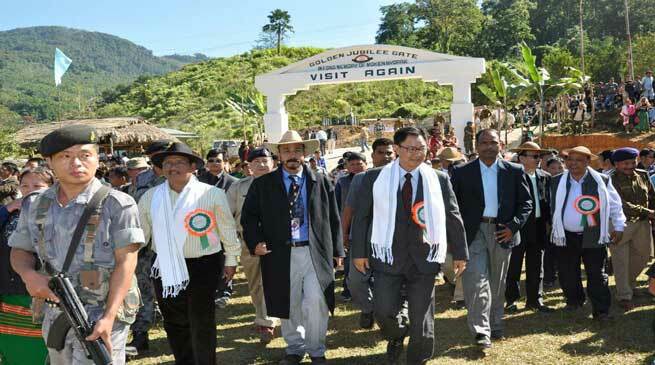 The Golden Jubilee Gate erected in fond memory of land donor of Nyorak School, Late Moken Nyorak was inaugurated by Kiren Rijiju, Minister of State for Home GOI amid cheer and applause to mark the Golden Jubilee Celebration of Nyorak Upper Primary School on 20th Nov last. Addressing a huge gathering, Rijiju exhorted the Alumni and village people to shoulder social responsibility and welfare of the school as we all have been doing from time immemorial and Govt is always there to help the people, Responding to memorandum submitted on the occasion on various necessity, he announced Rs. 40 lacs to take up urgent and immediate needs of the school. Rijiju also released a Souvenir to mark the auspicious occasion, He disclosed that sizeable amount were placed on DONER Ministry to take up developmental activities in Arunachal Pradesh and further grants could not be given due to non submission of Utilization Certificate even for the year 2013-14 while other smaller states have done it and getting the central grants. He also lauded the effort of the people to conduct social services on self help basis at Nyorak-Nikte road and appealed people to cooperate with the Executing Agencies to take up development activities in the area. Inaugurating the Golden Jubilee Assembly Hall, Bamang Felix Parliamentary Secretary Education assured that look into their demands of two teacher quarter and other issues in the next financial year. He also appealed the teachers to impart quality education and values of life within and outside class rooms as their guidance and wisdom are needed everywhere. He appealed the people to refrain from hunting and destroying greenaries around to maintain balance of the nature. The Special Guest, Er. Tumke Bagra disclosed that Rs.10 Crore under SPA made available to him will be fully utilized on Nyorak-Nikte Road for common development and sought peoplesâ€™ cooperation and sincere execution by entrusted agencies. Kenli Nyorak Organizing President of GJCC, Shri Goto Nyorak Mayi and Henmar Nyorak Mayi Chairman GJCC submitted memorandum and dwelt on the eventful journey of the school in its 50 glorious years of journey. Tomo Bagra the first teacher of the school and Talek Jilen, the long serving teacher of the school were also felicitated on the occasion.